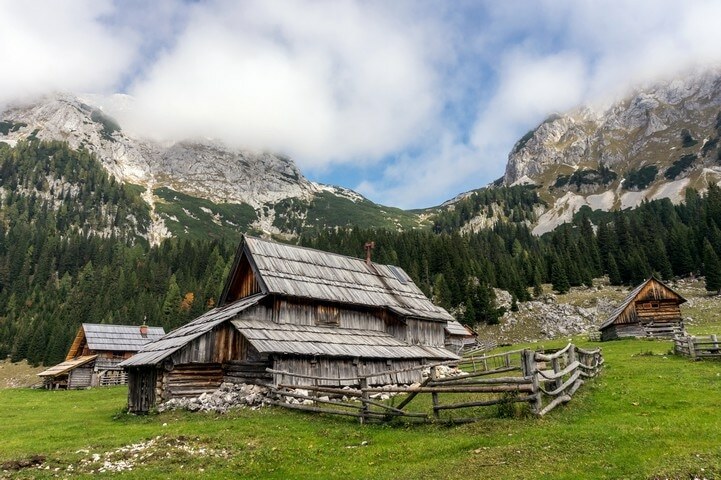 The Bohinj Pastures Route is a long but pleasant walk that will take you to six traditional cheese production farms and dairy pastures. Some of them are still active, offering delicious, homemade dairy products: not too bad for a mid-hike snack. Yes, at Ukanc campground, and Danica campground. 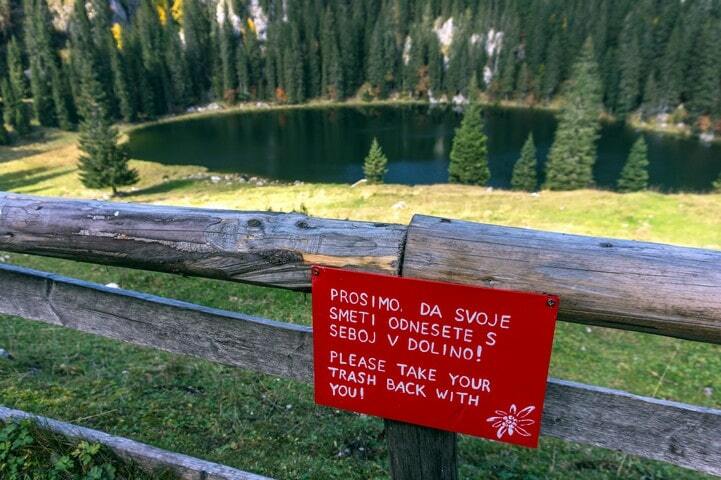 Yes, at the Trailhead, or at Kosijev dom na Vogarju. From the parking lot go north on the gravel road. Just as the road turns right, and starts to descend towards the Blato pasture, go to the right on the unmarked foot path. 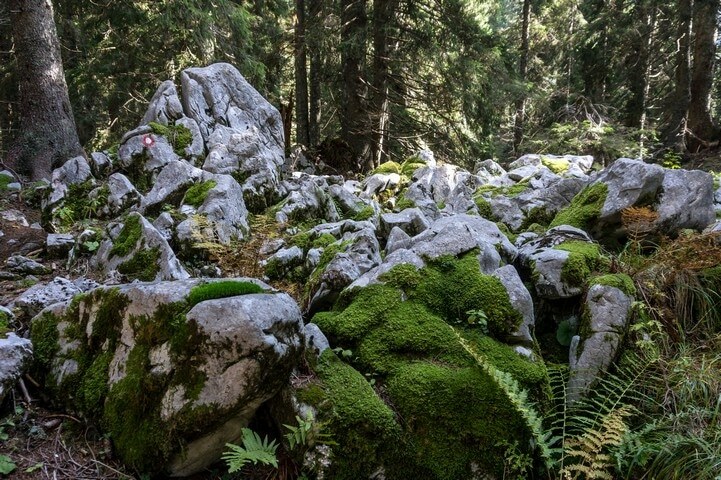 This trail is the hunter´s path to Krstenica pasture. 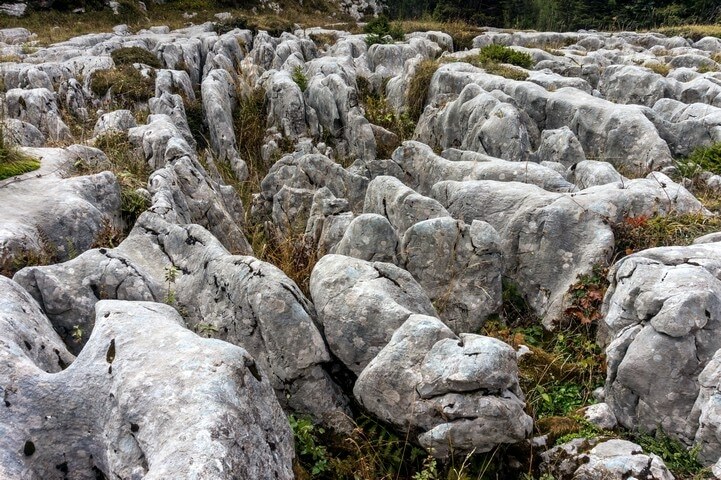 Watch your step for a few metres across the stone escarpment. A nice view to the Blato pasture opens up through the branches. The path passes into the forest and crosses a wide cart track. In a few metres the path turns to the right and starts to climb parallel to the steep cart track. Later, up the path, you’ll turn a bit to the left and gain elevation. 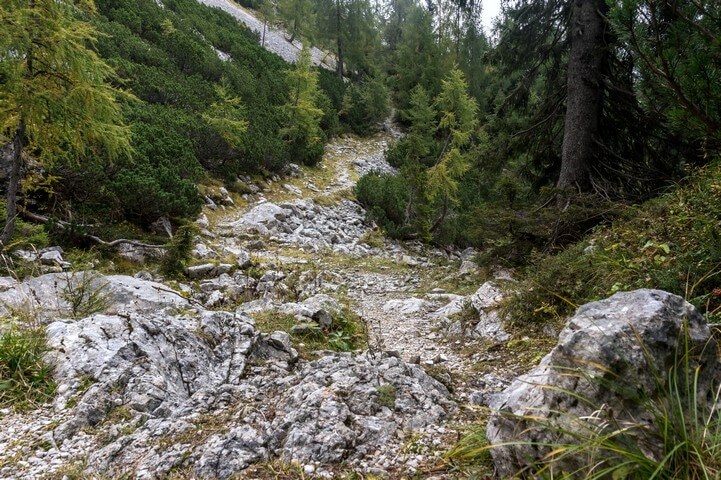 A few switchbacks higher the path flattens out, and soon you will reach a small hunter´s cabin. There is a view point from the back of the cabin, just a minute away. Continue from the cabin on the known track. Soon the path comes out of the woods. Cross the clearing and get back on the cart track. Just a few minutes of walking and you will get to the bottom edge of the Krstenica pasture. Follow the cart track to the crossroads where the marked path from Blato joins. Turn right. 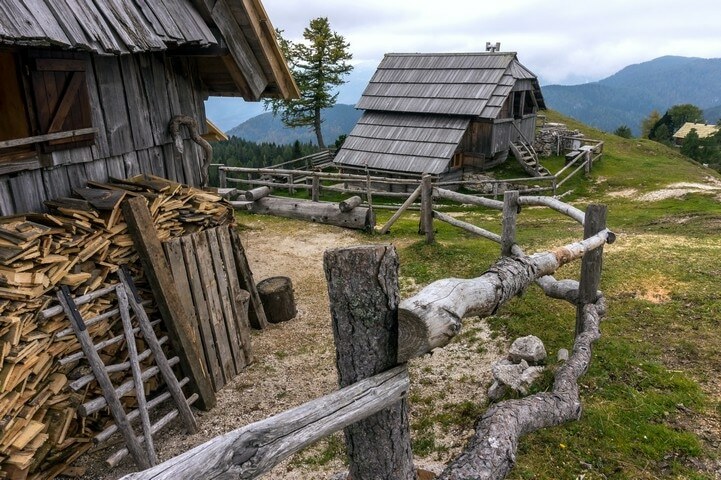 Look around the pasture, have a quick break and enjoy the beautiful view of the Bohinj mountains. The best time to come here is in October when the larches turn yellow. It is really a magical place.  Take the marked, single trail to the south – in the direction of Blato pasture. In about 50m, stay on the upper path to the right, going in the direction of V Lazu pasture. Follow the marked trail. 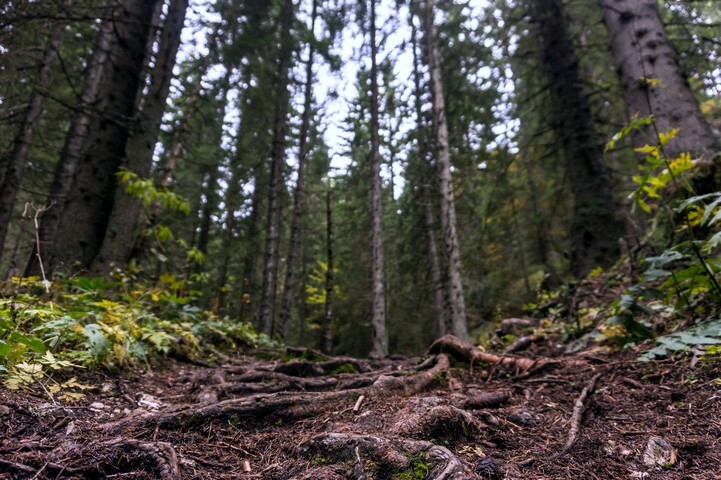 You’ll continue on down the path and, at some point, you will enter a small clearing in the woods. At the bottom of the clearing you’ll pass back into the forest and turn slightly to the right. Eventually the path from the panoramic peak of Ogradi will join from the right side. It is an easy climb, if you have enough time to do it. At this point the view opens up, revealing the steep slopes of Ogradi to the right. Just a few minutes later the path from Blato pasture joins from the left. You’ll drop down and get to the V Lazu pasture. Drop down to this scenic, pristine alpine village. Cross the meadow and stop at one of the many shepherd´s huts. You can buy some cheese or sour milk. To continue with the hike, take the wide cart track at the western edge of the V Lazu pasture. After a short descent, the track turns to the left and then passes into a narrow valley. From here there is not much to say. Just follow the cart track and in about an hour you will get to the Pri Jezeru pasture. 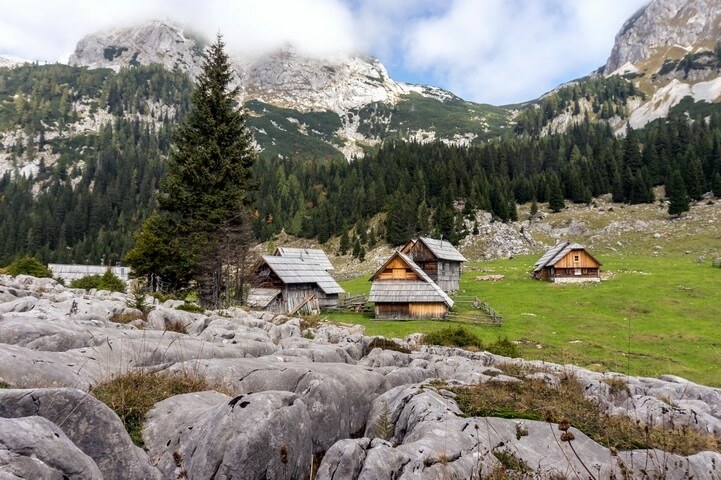 After some refreshment from the lodge at Jezero pasture, take the wide cart track on the south-eastern side. Follow it for about 200m. 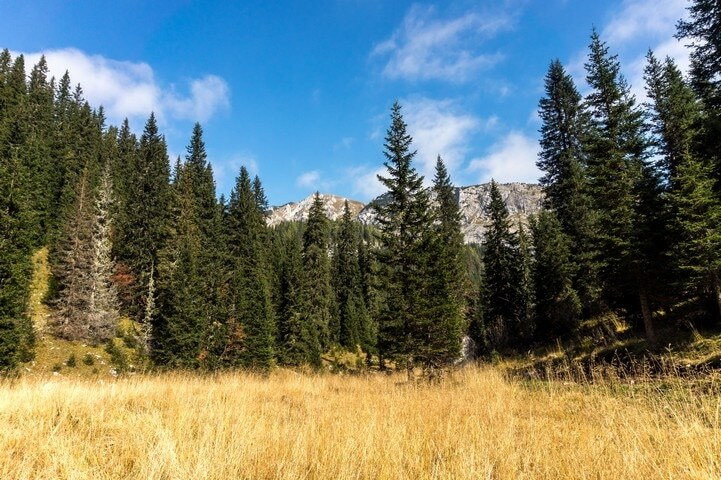 Then, turn right onto the forest foot path in the direction of Planina Vodični vrh and Planina Vogar (if you continue on the cart track, you will get to the parking lot at Blato). 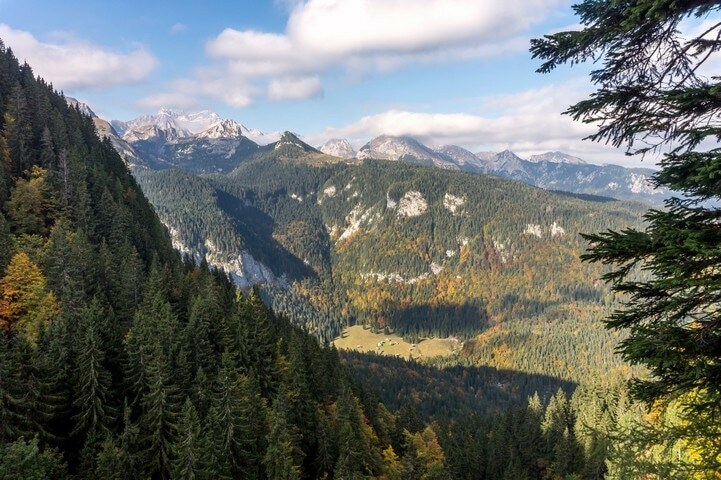 The path starts to climb through the woods until it almost reaches the peak of Vodični vrh on the left. The path then descends and turns slightly to the left. As the path flattens you will spot a larger stone with a marking for Vogar on it. Turn right and make a short detour. 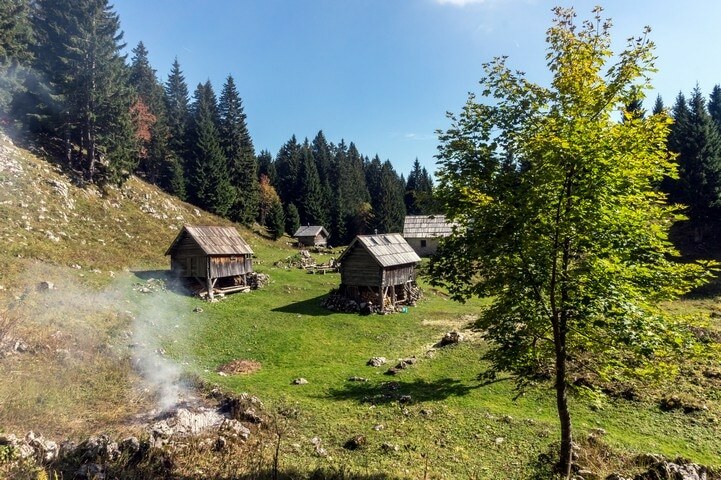 Just a few metres down is the Vodični vrh pasture; it’s worth visiting for its small, peaceful shepherd´s cottages. After a deep breath at the pasture, return back to the forest path and continue in the direction of Vogar. Look out for the view point with a bench on the left but, be careful. Do not walk too close to the edge! Continue on the track, descending quickly. At some point you will reach a wide gravel road. 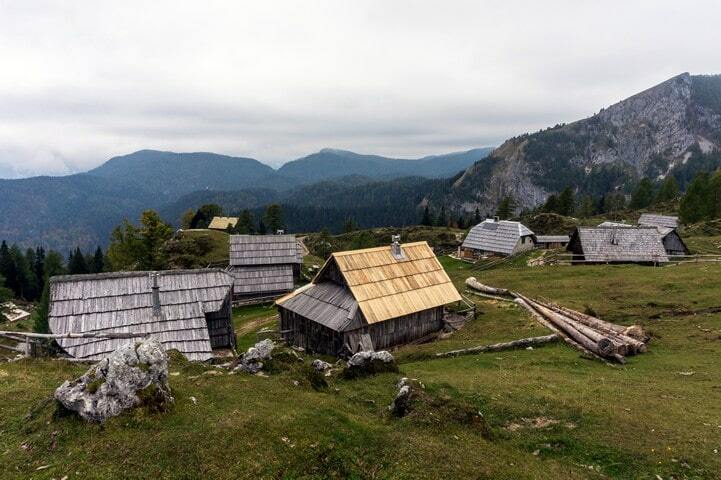 You can follow the gravel road to the left and go back to the parking lot, or you can drop down to the right and – in just a few metres – visit the Kosijev dom lodge at Vogar. It is a ten-minute walk from the road. 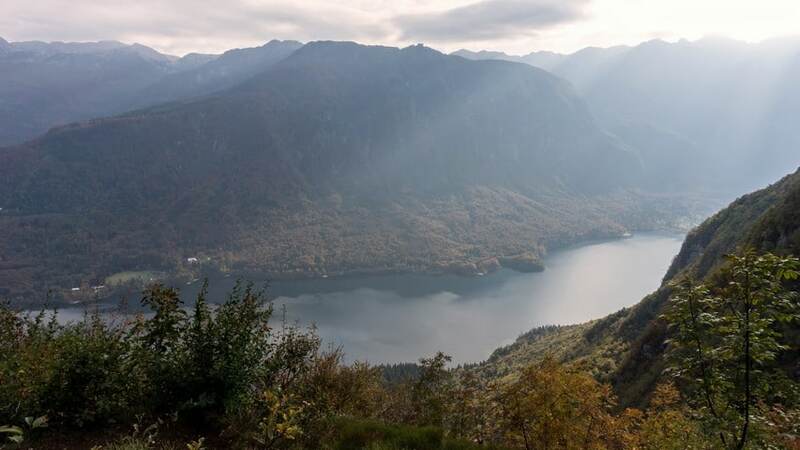 There is a view point of the Bohinj lake just five minutes away from the lodge. Return to the gravel road and continue north. In about 1.4km you will get to the crossroad. Take the road to the left in the direction of Blato pasture. The parking lot is just 750m ahead. At the gravel parking space, you will have to pay the fee for the mountain road (10€). It is essential that you come early in the morning (best before 6AM). In the season the parking fills up very fast even midweek. It is possible to buy some home made dairy products at almost every pasture during the season. There is a possibility to sleep over in some of the shepherd´s cottages and experience a true alpine dairy farming life. 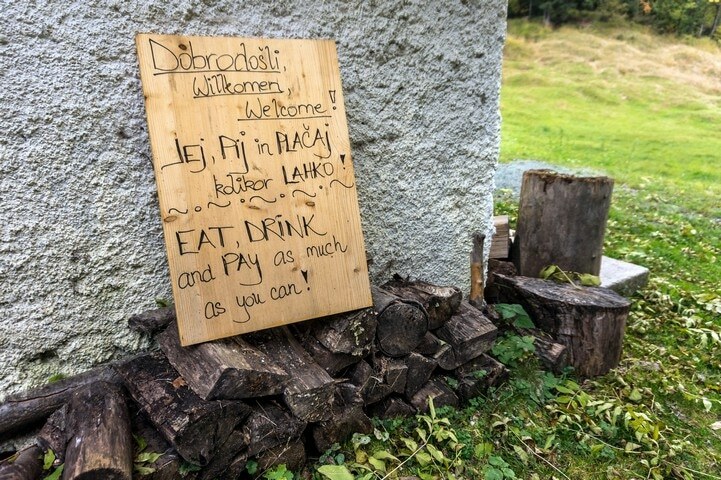 Ask the locals at Stara Fužina. It’s important to note that you will have to bring a sleeping bag. Be sure not to miss late lunch or dinner at Mihovc in Stara Fužina village. They really know their business.